Nowadays, “web services” often means REST (Representational state transfer) APIs using JSON as the data exchange format. However, the first generation of web services was built using SOAP (Simple Object Access Protocol), a standard protocol based on XML. In many enterprises, SOAP web services are still important assets, and some APIs are only available via SOAP. Unfortunately, SOAP is fairly heavy weight, and working with XML-based SOAP payloads in Node.js is not very fun. It’s much nicer to use JSON and to wrap or mediate a SOAP service and expose it as a REST API. As an API server to glue existing and new data sources, LoopBack is designed to facilitate your backend data integration. With the release of loopback-connector-soap module, you can now easily consume SOAP web services and transform them into REST APIs. In this blog, I’ll walk you through the steps to connect to an existing SOAP web service and transform it into a REST API. The example code is available here. It uses a public SOAP-based weather service from here. To invoke a SOAP web service using LoopBack, first configure a data source backed by the SOAP connector. SOAP web services are formally described using WSDL (Web Service Description Language) that specifies the operations, input, output and fault messages, and how the messages are mapped to protocols. So, the most critical information to configure a SOAP data source is a WSDL document. LoopBack introspects the WSDL document to map service operations into model methods. wsdl: HTTP URL or local file system path to the WSDL file, if not present, defaults to < soap web service url >?wsdl. NOTE: The SOAP connector loads the WSDL document asynchronously. As a result, the data source won’t be ready to create models until it’s connected. The recommended way is to use an event handler for the ‘connected’ event. Once the model is defined, it can be wrapped or mediated to define new methods. 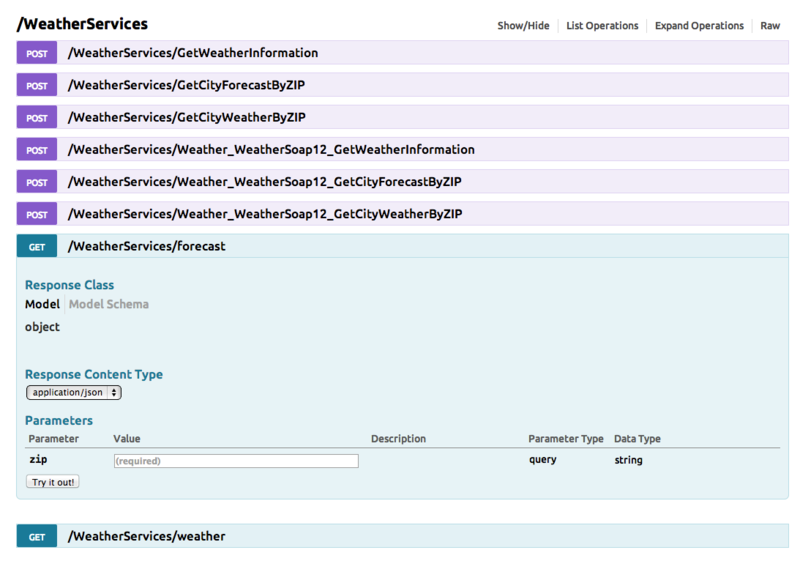 The following example simplifies the GetCityForecastByZIP operation to a method that takes zip and returns an array of forecasts.